Whitworth University yet again has captured a spot on Kiplinger's annual rankings of the 100 best values among private liberal arts colleges and universities in the United States. The university joins some of the most elite schools in the country on the magazine's 2010-11 rankings. Whitworth is one of the smallest universities to appear on the list, yet it is the second-highest-ranked school in the Pacific Northwest and ranks ahead of all but a handful of other private universities on the West Coast. The list is posted to the Kiplinger website and appears in the December issue of Kiplinger's Personal Finance magazine. The magazine ranks the 100 best values among private liberal arts colleges and the 100 best values among private universities separately but based on the same criteria of academic quality and affordability, with academic quality accounting for two-thirds of the formula. Princeton University tops Kiplinger’s list of best university values, followed by Yale, the California Institute of Technology and Rice. West Coast schools joining Whitworth (No. 51) in the upper portion of the rankings are Stanford University (No. 12), the University of Southern California (No. 28), Gonzaga University (No. 32), Santa Clara University (No. 43), and Pepperdine University (No. 44). Whitman College is ranked 26th on the list of best liberal arts college values. The complete rankings can be accessed online at http://www.kiplinger.com/tools/privatecolleges/. 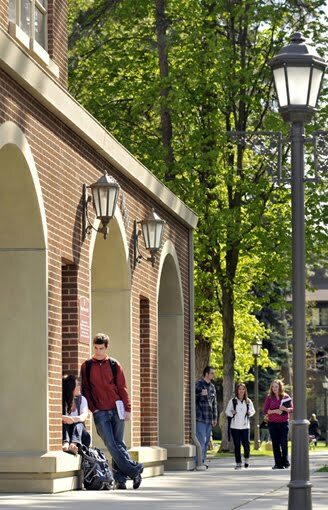 "Being ranked by Kiplinger's as one of the best values among all private universities in the U.S. is yet another indication of Whitworth's academic quality and reputation," says Fred Pfursich, vice president for admissions and financial aid at Whitworth. "This ranking clearly acknowledges our commitment to the liberal arts and sciences in a supportive and challenging learning environment." The academic quality measures in Kiplinger's rankings include the percentage of applicants granted admission; the percentage of 2009-10 freshmen who scored 600 or higher on the verbal and math sections of the SAT or 24 or higher on the ACT; student-faculty ratio; and four- and five-year graduation rates. Whitworth's student selectivity has increased dramatically as the number of freshman applications has grown more than 570 percent, to 6,464 for fall 2010 from 1,115 in 2000. With a freshman class of 683 students this fall, Whitworth's 54 percent acceptance rate was among the lowest of its peers, and the average SAT scores of its 2010 freshman class were among the highest. At the same time, the university's freshman-sophomore retention and six-year graduation rates in recent years have reached record highs that are well above national averages. In addition, Whitworth has maintained a 13-to-1 student-faculty ratio even as undergraduate enrollment has risen. The financial aid measures factored into Kiplinger's rankings include total costs for the 2010-11 academic year, cost minus the average need-based aid amount (excluding loans), the average percentage of a student's financial need met by the school's aid package, the percentage of the average aid package that comes from grants or scholarships, the cost for a student with no demonstrated need after subtracting the average non-need aid amount (excluding loans), the percentage of all undergraduates without need who received non-need-based aid, and the average amount of debt owed by a graduate who took out an educational loan. Whitworth will provide more than $35 million in grants and scholarships to undergraduate students this year. The average financial aid award for Whitworth students receiving aid is $24,119. "Whitworth is a great value and a great investment," Pfursich says. "A Whitworth education empowers students with broad knowledge and transferable skills, cultivates intellectual agility, and fosters ethical and social responsibility." Fred Pfursich, vice president for admissions and financial aid, Whitworth University, (509) 777-4348 or fpfursich@whitworth.edu.